Coresidential unions of unmarried partners (cohabitations) in European countries have been increasingly common since the second half of the 20th century. Not only do a majority of people nowadays cohabit before marrying (or, increasingly, instead of marrying), but many also decide to have a child within a cohabitation. Indeed, the proportion of children born to a cohabitation has been on the rise for several years in most European countries, reaching more than 50% in some of them, such as France or Sweden. In a recent study (Žilinčíková 2017) I contributed to knowledge of cohabitation stability in Europe by analysing retrospective reports of partnership histories from the Generations and Gender Survey (GGS; 2004-2013). I focused on unions formed after 1990, and assessed their stability, considering their type and the presence of children. How stable are cohabiting unions? As expected, cohabitations prove less stable than marriages, and childless cohabitations less stable than unions with a child. However, countries differ greatly in the dissolution rates of cohabitations (see Table 1). In Sweden and other western European countries, childless cohabiting unions are highly unstable, in constrast to the relative stability of cohabiting unions with a child (with the exception of Germany). The countries of Central and Eastern Europe seem to be divided into two subgoups: on the one hand, countries (including Czechia, Estonia, Hungary and Russia) where cohabiting unions are unstable, both with and without children; on the other, a group of countries where they are relatively stable. These are mainly countries where religion plays an important role (Bulgaria, Georgia, Lithuania, Poland, Romania). I also looked at the relative stability of cohabiting unions in comparison to marriage, assessing the risk of dissolution throughout union duration. The analysis controlled for the influence of other potentially relevant individual characteristics such as age and years spent in education. The results are displayed in Figure 1. All control characteristics being equal, the risk of dissolution is highest for childless cohabiting unions and lowest for marriages with children. This pattern of stability is quite similar across all countries. Cohabitations with a child are significantly more stable than childless cohabitations in most of the observed countries (ten out of fourteen countries; the exceptions being the Czech Republic, Lithuania, Georgia and Romania, where the difference is not significant). For marital unions, the difference in the stability of unions with and without a child is distinctly less pronounced, and in most countries is non-significant. Marriages with a child are significantly more stable than childless marriages in less than half of the observed countries (Austria, Belgium, Bulgaria, Hungary, Russia and Romania). When accounting for the control variables, cohabitations where one or more children are present prove more stable than childless cohabitations in all the western European countries examined. The presence of a child is associated with a 69% reduction in the risk of a break-up of cohabitation in Sweden, a 56% reduction in Belgium, 42% in Austria, 31% in Germany and 25% in France. For most central and eastern European countries the risk reduction is generally between 30% and 35% (Estonia, Russia, Hungary, Lithuania, Poland), but somewhat smaller in Czech Republic (23%) and Romania (21%).²An exception in this region is Bulgaria where the risk of dissolution is reduced by 54% when a child is present, and Georgia where children in cohabitation do not seem to reduce the dissolution risk. 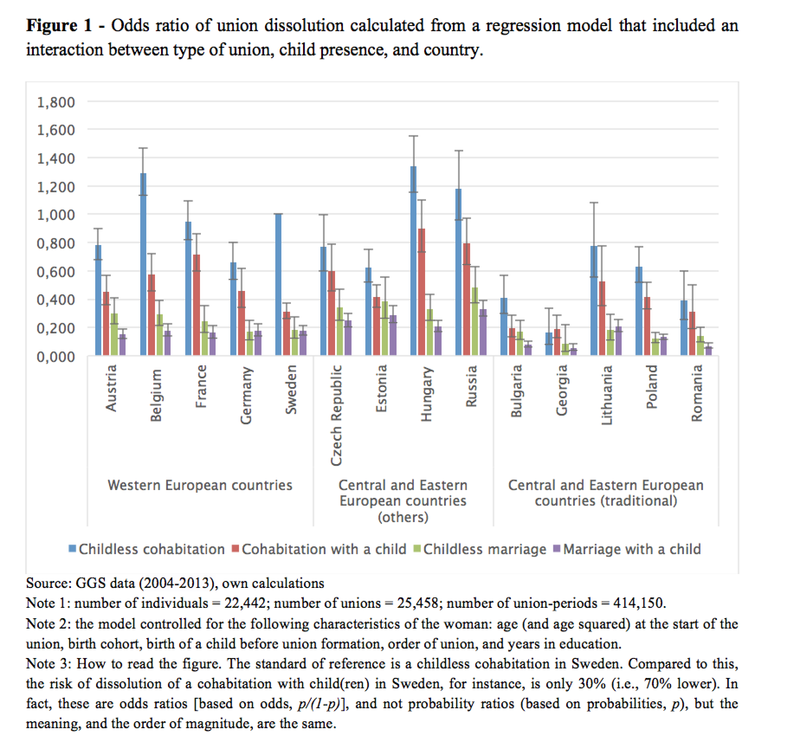 In the context of overall stability, the reduction in the risk of a dissolution by child presence has a different meaning for the countries in which cohabiting unions are rather stable (e.g. Georgia, Romania, Bulgaria), and in countries such as Russia and Hungary where both types of cohabitation, with or without children, have a high risk of dissolution. The results of the research confirm the general, well-known pattern that cohabitations are less stable than marriages, and unions with children are more stable than those without children across a number of European countries. Further, conclusions of this study are in line with the findings of previous studies, observing a higher prevalence of non-marital cohabitations in western European countries (where childless cohabitations are substantially less stable than cohabitations with children) than in central and eastern European countries (Hiekel, 2014). In this latter region, cohabitations seem to be more alike irrespective of child presence. Andersson, G. (1997). The impact of children on divorce risks of Swedish Women. European Journal of Population 13(2): 109-145. Hiekel, N., Liefbroer. A.C., Poortman, A.R. (2014). Understanding diversity in the meaning of cohabitation across Europe. European Journal of Population 30(4): 391-410. Zilincikova, Z. (2017). 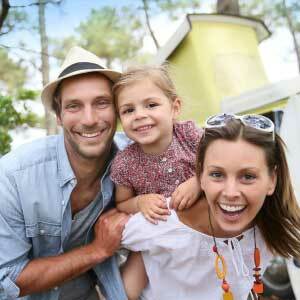 Do Children Matter for the Stability of Cohabitation? A Cross-National Comparison. Population, English Edition, 72(4):649-970. ² The difference in Lithuania, Czech Republic and Romania was statistically insignificant.